(Nanowerk News) Researchers at Michigan State University have built a molecular Swiss Army knife that streamlines the molecular machinery of cyanobacteria, also known as blue-green algae, making biofuels and other green chemical production from these organisms more viable. "The multifunctional protein we've built can be compared to a Swiss Army knife," said Raul Gonzalez-Esquer, MSU doctoral researcher and the paper's lead author. "From known, existing parts, we've built a new protein that does several essential functions." Researchers at Michigan State University have built a molecular Swiss Army knife that streamlines the molecular machinery of cyanobacteria, also known as blue-green algae, making biofuels and other green chemical production from these organisms more viable. For this research, Gonzalez-Esquer worked with Cheryl Kerfeld, the Hannah Distinguished Professor of Structural Bioengineering in the Michigan State University-DOE Plant Research Lab, and Tyler Shubitowski, MSU undergraduate student. Kerfield's lab studies bacterial microcompartments, or BMCs. These are self-assembling cellular organs that perform myriad metabolic functions, and in a sense, they are molecular factories with many different pieces of machinery. They modernized the factory by updating the carboxysome, a particularly complex BMC that requires a series of protein-protein interactions involving at least six gene products to form a metabolic core that takes CO2 out of the atmosphere and converts it into sugar. 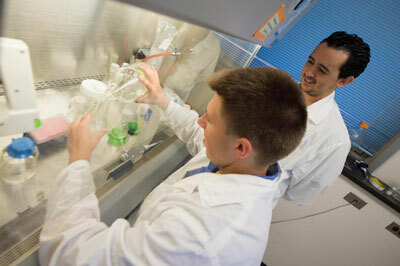 To streamline this process, the team created a hybrid protein in cyanobacteria, organisms that have many potential uses for making green chemicals or biofuels. The new protein replaces four gene products, yet still supports photosynthesis. Reducing the number of genes needed to build carboxysomes should facilitate the transfer of carboxysomes into plants. This installation should help plants' ability to fix carbon dioxide. Improving their capacity to remove CO2 from the atmosphere makes it a win-win, Gonzalez-Esquer said. "It's comparable to making coffee. Rather than getting an oven to roast the coffee beans, a grinder to process them and a brewing machine, we've built a single coffeemaker where it all happens in one place," he said. "The new tool takes raw material and produces the finished product with a smaller investment." This proof of concept also shows that BMCs can be broken down to the sum of their parts, ones that can be exchanged. Since they are responsible for many diverse metabolic functions, BMCs have enormous potential for bioengineering, said Kerfeld, who also is an affiliate of the Berkeley National Laboratory's Physical Biosciences Division. "We've showed that we can greatly simplify the construction of these factories," she said. "We can now potentially redesign other naturally occurring factories or dream up new ones for metabolic processes we'd like to install in bacteria." However, this altered cyanobacterial species won't be taking over any ponds, or the world, anytime soon. While the improved organisms excel at photosynthesis in a lab setting, they're ill prepared to compete with other bacteria. Because they were stripped of four genes, they're not as flexible as their natural cousins. "Cyanobacteria have adapted to live in ponds that are drenched by sun, blanketed by shade, frozen solid in the winter, not to mention the other organisms with which they have to compete to survive," Kerfeld said. "We've restricted ours and their ability to grow; they no longer have all of the tools to compete, much less dominate, in the natural environment."